These are alternatively called crystal earpiece, piezo earpiece, crystal earphone, piezoelectric crystal earpiece, and sometimes crystal receiver. 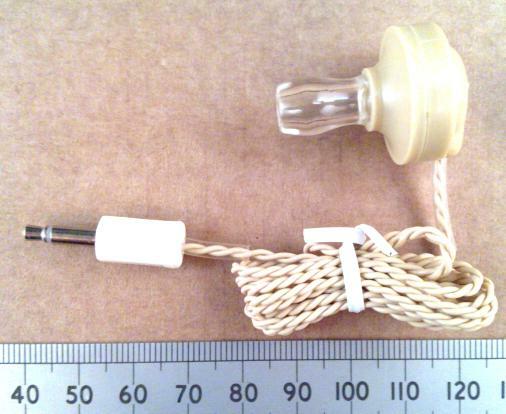 A while ago I bought a few hundred of these little earpieces from a UK retail distributor to sell with crystal radio kits. They are not the finest, most hi-fidelity piece of listening equipment available, but they are quite sensitive at low signal levels and have a fairly high impedance of about 27nF capacitance and very high d.c. resistance. I was a bit puzzled by strange intermittent behaviour on one that I was using and received a couple of returns from customers. Time for some investigation. Of my remaining stock of 100, I found that about 30 were dead. 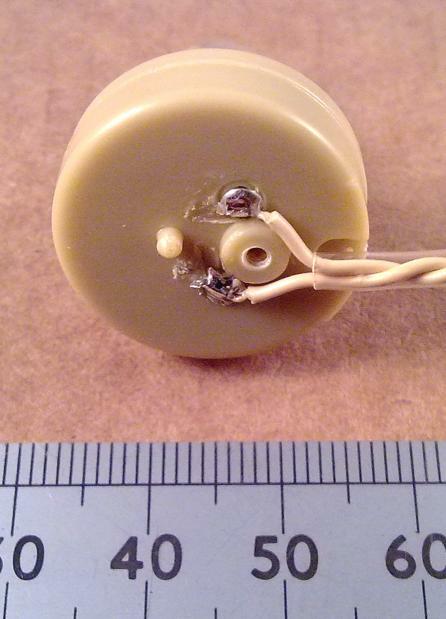 They were open-circuit when connected to a low level transformer coupled crystal set output and some of them would wake-up when plugged into a transistor radio earphone socket. A few would be intermittent and respond to touching of the diaphragm or squeezing the plastic body itself. With a capacitance meter connected it would show low capacitance when not working and when squeezed in the right place would buzz and show about 27nF. This was a puzzle, but I wrote those off and bought another 100 from another UK retail distributor. The results on testing were the same, and the distributor tested their stock on a radio earphone socket and admitted that there was a quality problem and removed the item from sale. After another couple of months they were back on sale with fresh stock. Unfortunately the construction remains exactly the same and so the problem remains. This time 38 out of 100 units tested dead on the crystal radio, and about 25 still showed completely dead on a powered radio output earphone socket. 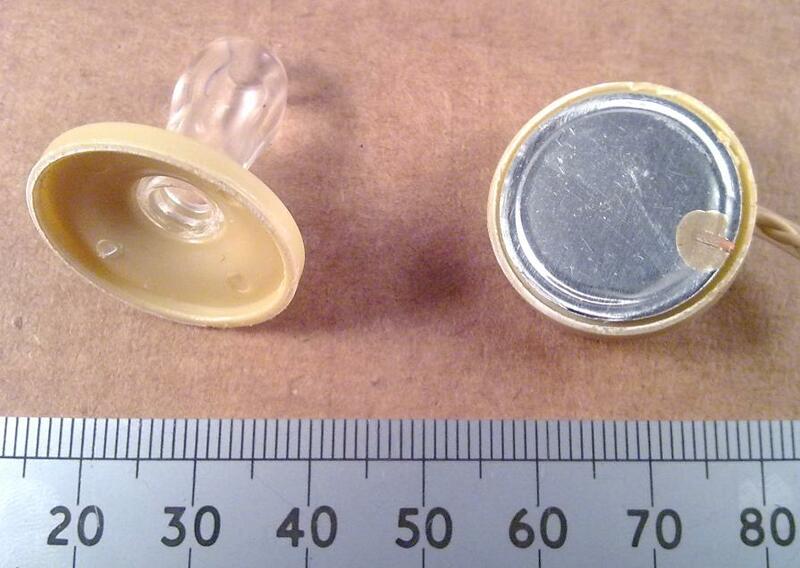 Let's look first at the manufacturing problem inside the earpiece. After unscrewing the rear cap you can see the soldered connections at the back. So far, so good. Then after splitting the plastic case in two along the seam you can see the front of the aluminum diaphragm. After carefully cutting through the glue and easing the diaphragm up, you can see the rear side where the ceramic element is visible. 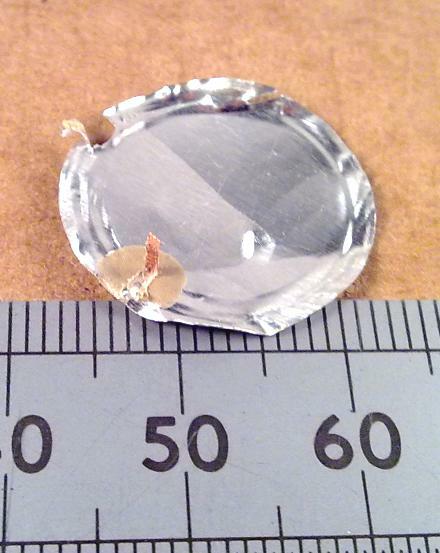 The ceramic element has a metal plating on its underside. There is a small copper strip soldered to this plating at one end and to the wire contacts at the other. The other wire contact has another copper strip and this goes to the outer edge of the diaphragm. 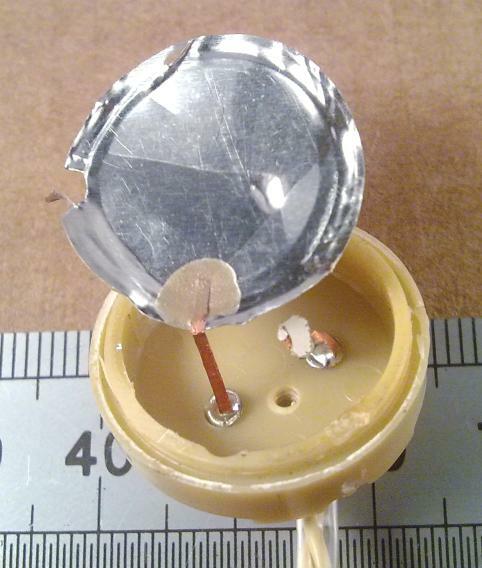 This is the second contact to the piezo element. It seems that when undergoing assembly, the strip is folded round to the front face of the diaphragm, the diaphragm glued into place then the strip folded down, blobbed over a bit with more glue before the unit is sealed around the split line, either with cement or maybe ultrasonic welding. There is a problem. The contact to the aluminum diaphragm is being made with a copper strip being held against it just by having non-conductive glue blobbed over it, and by whatever force might be pressing upon it from the glued seam. This will often be zero force. The units may work after assembly but after passage of time and a flight in an aircraft it is inevitable that the connection will be poor. There are reasons that switch contacts aren't made out of aluminium, and one of those is that the hard aluminium oxide coating that forms on it in air is non-conductive. You need real contact force to make an electrical contact. Whatever the case, you can't make a reliable electrical contact with zero contact force and non-conductive impact adhesive. You could probably cure this problem cheaply by blobbing a tiny amount of conductive paint glue under the copper strip during assembly, even if that was also a bit of a nasty fiddle. You really need to make a solder connection, and that would mean changing to a solderable material for the diaphragm. The distributor replaced my duds and said that they had quite a discussion with the manufacturer. 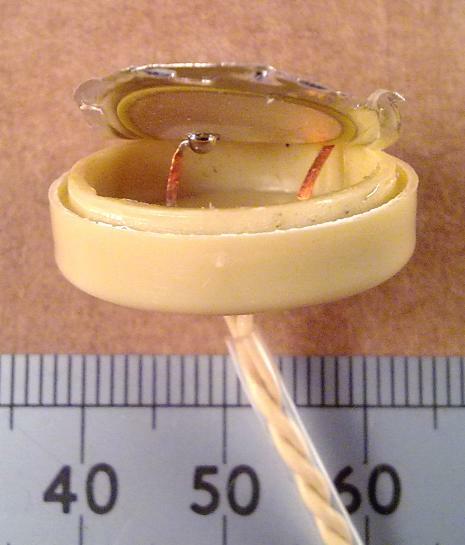 The manufacturer's reply was that the returned stock tested out OK because the measured impedance was greater than the minimum specification of 2M Ohms. "Sigh." Yes; Open circuit connection problems will tend to test out OK if a high d.c. resistance is your specification for a good item. Sometimes people don't want to listen and will give any stupid answer. I'm afraid that when dealing with far eastern factories, you have to be a bit more persistent after the first series of attempted brush-offs. Despite knowing about the problem, the UK distributor intends to continue supplying these to retail customers untested. As the entire production is probably made in one small group of factories, the problem is likely to be worldwide. I'm hoping that, "By the Power of Google," this article will eventually get to the attention of the actual factory, the named manufacturer Eagle or Altai and the UK importer who I believe to be Electrovision. I won't single out any retail supplier as everyone in the whole world is probably doing the same thing. The retail supplier made some defense of their attitude by pointing out that customers are not generally slow in coming forward with problems where they are encountered, and that I'm the only person seeing a problem. I have an explanation for this: The vast majority of these earpieces are going to be connected to crystal set radios which will be put together by kids during the summer holidays or a few days after Boxing Day. If, as a kid, you can't get a crystal set working you tend to assume that your aerial isn't big enough, you're doing something wrong, or that crystal radios just don't work, it's boring and that throwing it into a corner is the best course of action. Connecting your piezo earpiece to a standard mp3 player or similar will usually show if it is dead or not, though in about 20% of cases the higher level signal from a powered device can wake up an intermittent earpiece. If I've sold you a dud in the past feel free to ask for a new one. So let's see what happens in the fullness of time. Until the manufacturer makes a production change, I recommend that you buy tested items from me. You can get those from here: The Useful Components Ebay Shop.